[DECLARATION OF INDEPENDENCE]. Broadside. [Exeter, New Hampshire: attributed Robert Luist Fowle], [ca. July 16-19, 1776], two-column format, sheet size approx. 15&frac18; x 19&frac58; in. Pin holes in three corners, with the upper-left corner torn in approx the same position, indicates that this was posted publicly to spread the momentous news. 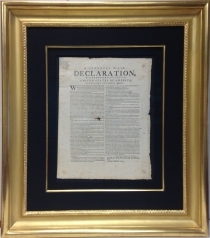 For information about this and other July 1776 broadsides of the Declaration, please call Seth Kaller at (914) 289-1776. With a very brief resolution on July 2, 1776, the Continental Congress in Philadelphia boldly proclaimed the United States to be “Free and Independent” from Great Britain. The delegates then began debating the formal Declaration text, which passed on July 4. Pledging their lives, fortunes, and sacred honor to uphold the principles put forth, the approved Declaration was then signed by only two men, Continental Congress President John Hancock and Secretary Charles Thomson (often misspelled “Thompson,” as in the present example) and taken to the office of printer John Dunlap. The Congressional committee responsible for writing the Declaration was ordered to supervise its publication. On the morning of July 5, Dunlap delivered the freshly-printed copies to Congress. Over the next few days, John Hancock sent the official broadside to the thirteen former colonies and to General George Washington and other military commanders. Meanwhile, on July 6, the Pennsylvania Evening Post became the first newspaper to print the text.The Signers sent Declaration copies to their families, friends, and associates, as did private individuals and members of the press. 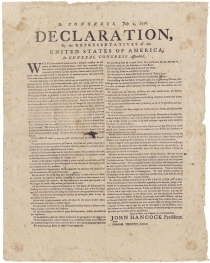 During the next few weeks, the Declaration was re-published throughout the country in locally-printed broadsides and newspapers, both official and unofficial. Public readings were followed by huzzahs, thirteen-gun salutes, parades, toasts, and often times, boisterous mobs that committed monarchial symbols to the bonfire. The first copies of the Declaration reached Boston on July 13. Four days later, James Warren wrote to John Adams that “The Declaration came on Saturday, and diffused a general Joy.” On July 16, the document arrived at the Massachusetts Revolutionary government, which was then meeting in Watertown. The Declaration helped conclude treaty negotiations with a group of Native Americans. James Bowdoin, the president of the Massachusetts Council, produced “the printed Declaration” and proceeded to read the closing lines of the text, assuring the tribes that “these united Colonies are and of right ought to be Free and Independent States . . . free . . . to Contract Alliances.” Signed the next day, the treaty is the said to be the first one entered into by the United States of America. The July 16, 1776 “Extraordinary” broadside edition of Robert Luist Fowle’s New Hampshire Gazette, or, Exeter Morning Chronicle (Exeter, N.H.). The July 19 issue of John Mycall’s Essex Journal and New-Hampshire Packet (Newburyport, Mass. ), page 4. The July 20 issue of Benjamin Dearborn’s Freeman’s Journal, or, New-Hampshire Gazette (Portsmouth, N.H.), page 1. Goff concluded that the text of this broadside is most similar to that of the New Hampshire Gazette “Extraordinary” and thus attributed the present broadside to Fowle. We have recently taken our own look at images of the three papers, and find that there are also similarities of typesetting between the broadside and the “Extraordinary” newspaper. Though we don’t have definitive proof that Fowle was the publisher, we agree that he is the most likely candidate, and therefore accept Goff’s attribution. Descended in the family of Charles Toppan (1796-1874), Newburyport, Mass., through the last 1990s. Acquired by us privately in 1999. Toppan, the first President of the American Bank Note Company, engraved the first facsimile of Jefferson’s draft manuscript of the Declaration for Thomas Jefferson Randolph’s 1829 Memoir of Jefferson. It is unclear if Toppan acquired this then, or if it had been in his family from 1776. Two versions of this broadside have been identified: In the first, John Hancock’s name is misspelled as “Hacock”; in the second (of which the present document is an example), the error is corrected and the last three lines of type reset. Neither version bears an imprint, but the provenance of several examples suggests the publisher was located in southern New Hampshire or northern Massachusetts. That, in turn, likely indicates a publication date before the first known newspaper printing in the area, in Exeter on July 16. Including the present copy, there are 10 or 11 known copies of this Declaration broadside. After Washington’s copy of the Dunlap was read before the American Army in New York on July 9, a mob pulled down the lead statue of George III in Bowling Green. The king and his horse were transported to Connecticut and cast into 42,088 musket balls for the American cause. 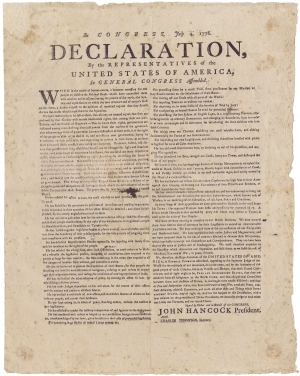 Frederick R. Goff, “A Contemporary Broadside Printing of The Declaration of Independence, The Quarterly Journal of Current Acquisitions, Library of Congress, Vol. 5, No. 1, November 1947.